Burglary Rated Safes. 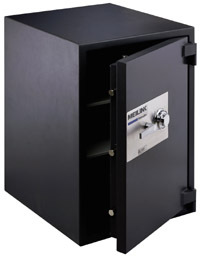 When theft is your primary concern and the value of your safe's contents is on the rise, Hercules may just be the answer. Hercules has been designed for home and commercial use to protect items that reach into the many thousands of dollars in value. These safes can thwart sophisticated attacks and also offer varying degrees of fire protection. Hercules "C" rate design provides better (than UL-RSC) theft protection. Hercules models also carry a half-hour fire rating. Each safe features high quality dial combination locks (digital combination locks optional) with an internal relocking device. 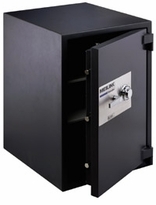 The Hercules C-class safes offer a 1/2 hour UL fire rating and our exclusive high density 9200 psi composite material. This composite material is the key to the increased security that can keep burglars from penetrating the safe on all six sides. It's the only safe in its class with 1" horizontal and vertical bolts. Include 2-1/2" high density walls with 4-1/2" doors and a formed body and you understand why these safes earn the name Hercules.